Star Wars: The Last Jedi was deeply satisfying to me on several levels. I appreciated its feminism, especially in this current political moment when women's leadership has felt devalued in the public sphere. I enjoyed its subversive qualities. And most of all I appreciated what I understand to be the film's implicit theology, which resonates neatly with my own. Luke tells Rey that the Force isn't a tool for lifting rocks or winning wars: it flows through everything, and is available to everyone. The movie wants to make sure we get that, so it offers that teaching in two forms: the pshat (surface) form of Luke flat-out saying so, and the remez (hidden / built-in) form of the discovery that Rey's parents were "nobodies." Rey isn't the next scion of some magical dynasty. She's just a regular person who's attuned to spirit and flow, and by extension, that means that any one of us could be (like) Rey. This teaching about the Force is pretty close to my understanding of God. Many religious teachers (among them Reb Zalman z"l, the teacher of my teachers) have offered the caution not to confuse the finger pointing at the moon with the moon itself -- not to confuse the pointer for the point, as it were. The Force is "the moon itself." What Luke calls the Force is what I call God, who in the words of the Jewish mystics "fills all worlds and surrounds all worlds." The Jedi tradition in which Luke placed his faith -- and in which Luke lost his faith -- was always only a pointer, never the point. And Rabbi Luke knew that, at least on some level, because he taught it to Rey: the Force doesn't belong to anyone. On the contrary, it flows through everything and everyone. The core question of hashpa'ah (spiritual direction) as I've been taught to practice it is "where is God for you in whatever's unfolding?" God flows through all aspects of our lives: the things we consider sweet, and the things we experience as bitter. As the Zohar teaches, leit attar panui mineh: there is no place devoid of God. Or in Star Wars' language, there is nowhere that the Force is not -- if we open ourselves to that flow. For me the tensest moment of the film was when Luke went to torch the ancient tree. I thought of my tradition's great destructions. I cringed to think of ancient texts burning (and was deeply relieved to learn that Rey had pinched them before leaving!) -- in part because there are too many stories of precious Jewish texts and teachings going up in flames, from Roman times to Kristallnacht. But even when enemies have tried to destroy my tradition (Babylon, Rome, the Nazis, you name it) they've failed, and one of the reasons for their failure is that the tradition is more than our texts, as precious as those texts are to us. The tradition lives in the minds and hearts of those who cherish it. The texts contain endless wisdom for which I am grateful, but they too are the pointer, not the point. And as long as there's someone left to uphold our teachings and study them and learn from them, then our teachings remain alive. As for us, so for the Jedi. Luke and Kylo Ren are positioned as opposites, and that's not unreasonable, but (for a while, at least) they align in their desire to forcibly end the old ways. Luke wanted to burn Jedi history in order to wipe history's slate clean of his order and the mistakes that it had (and he had) made. And Kylo claimed he wanted to discard the past -- though given that his ultimate goal was still dominance, I don't think he was destroying the past so much as planning to recreate it in his own image. But both of them missed the point: the way to move forward is to know where and who we've been, flaws and all, and then to build from there. That too feels to me like a very Jewish idea. Judaism today isn't identical to Judaism of a hundred years ago, or 500 years ago, or 3000 years ago. But neither is it completely discontinuous from what has been. Judaism is perennially renewing itself. I'm hoping that in Rey's hands, and in the hands of those she may someday teach, the Jedi tradition will do the same. Given the timing of its release, I couldn't help watching the movie through the lens of the Chanukah story. Not the story of the violent rebellion against brutal Greco-Syrian hegemony, but the meta-story of how my tradition chose to valorize the tale of the miracle of the oil that lasted beyond all reason over the tale of that military victory. Because focusing on military might can all too easily lead to more death (like the Bar Kokhba revolt -- or like Poe's ill-advised choice to bring down the star destroyer)... but cultivating hope in dark times can give us the strength to carry on. And the film ends on a note that resonates perfectly with that miracle-of-the-oil reading: a little kid recounting the story, and using the story to nurture a spark of hope. Hope for better than what exists now. Hope for a world without tyranny, a world of justice and kindness, a world where difference is celebrated and rights and freedoms are universally acknowledged to be the birthright of every living human being. May it come speedily and soon! I always enjoy the Forward's list of Most Inspiring Rabbis. I like that the focus is not on fame, but on inspiring others. In-spiring: infusing people with spirit, connecting people with God. That's a metric I admire. Each year when the Most Inspiring Rabbis list comes out I read it avidly, kvelling for friends and colleagues when I see their names there, and resolving to try to meet those on the list whom I do not yet know. I'm in amazing company, with some of my ALEPH / Jewish Renewal hevre (friends), and with some of my Rabbis Without Borders hevre, and with others whom I have long admired. Here's this year's list: Most Inspiring Rabbis 2016. Mazal tov to everyone on the list, and deep gratitude to those who nominated me! I was interviewed recently by Michael A. Burstein for the Jewish Advocate, for an article about Doctor Who, role-playing, and summer camp. Read the whole thing here: 'Dr. Who' to the rescue. Thanks for including me, Michael! We are helped, in our storytelling, by the materials we have at hand -- both our printed haggadot, and the stirrings of our hearts. Not surprisingly, my family uses the Velveteen Rabbi's Haggadah for Pesach to guide us along the way. But although it's the haggadah I've assembled, it's not the only one I love. I love all kinds of haggadot. I love the classical text, and I love the many variations thereupon, and I love that a haggadah can still recognizably be a haggadah even when things change. Hebrew or vernacular (or both), prose or poetry (or both), minimalist or maximalist -- I love them all. Now, for the first time, that haggadah is available in North America, exclusively through Print-O-Craft. The haggadah is stunning. Every page is different and every page is beautiful. The art brings the story to life. I'm a wordsmith; words have long been my trade. But this haggadah is as much about the visual storytelling as it is about the text, and I find myself lingering on every page. This is transformative work: the art changes my experience of the existing, and familiar, Hebrew text. I love that this is how we both celebrate, and continue to create, our peoplehood: by telling a story. Once upon a time we were slaves to a Pharaoh in Egypt, and the Holy One of Blessing brought us out from there with a mighty hand and an outstretched arm. There are so many ways to tell this central tale. The Christian season of Lent is almost here. I know that many of the Christians I know online choose to use this season as a time to "fast" from particular qualities or forms of internet use -- fasting from Facebook or Twitter, for instance, and using the time they would otherwise have spent on social media in prayer or contemplation. Yesterday I saw a reference to such a practice online. In response I tweeted that even those of us who don't celebrate Lent might consider thinking twice before we type. Even if you don't observe Lent... MT @mtjofmcap try thinking twice before typing something snarky or narrow-minded. Rabbi Josh Yuter asked what I meant by moderating tone. I found myself quoting Rabbi Harry Brechner's threefold rule: "Is it true? Is it kind? Is it important?" (I wrote about that in my 2013 post To shame someone is to shed their blood, about the "emerging Gemara" of ethical internet behavior.) In turn, R' Yuter noted that outrage is rarely kind. He has a good point. Our broken world demands justice, and sometimes the need to pursue justice may trump my desire to cultivate kindness. And, at the same time -- I've found that when I give too much energy to justice and not enough energy to kindness, my soul doesn't flourish. Kabbalah teaches us that God's qualities of chesed (lovingkindness) and gevurah (boundaries / strength) need to be kept in balance. Too much of either one isn't good for creation. I wonder whether each of us has a subtly different balance of healthy chesed and gevurah in our hearts and souls. My heart definitely calls for leaning toward kindness. I read a powerful article in the New York Times recently -- How One Stupid Tweet Blew Up Justine Sacco's Life. (If you haven't read it yet, I recommend it.) There are countless upsides of this interconnected world. One of those upsides is that we can use social media to create positive change. The shadow side is that sometimes we cause harm. We have new ways of hurting each other. Careless statements made online can be shared around the world in incredibly destructive ways. Most religious traditions preach the importance of moderating one's speech, and Judaism is no exception. In Mishlei (Proverbs) 10:19 we read, "Where there is much talking, there is no lack of transgressing, but the one who curbs the tongue shows sense." And in Pirkei Avot 6:6, moderation in speech is listed as one of the 48 qualities through which one acquires Torah, which can mean something like accessing deep wisdom or accessing flow of blessing from the divine. One rubric I sometimes use is: whatever I'm about to say, would I be comfortable saying it where my teachers could hear me? I have a particular group of teachers in mind -- but it could be your parents, your children, your sensei: someone(s) in your life whose opinion you value. For those of us who cultivate a personal relationship with God, that's another way to make the decision: if you were called before God tomorrow, would you feel glad about this remark, or would you regret having said it? I'm as prone as anyone to the Someone is wrong on the internet syndrome -- and sometimes my desire to correct all of those wrong people does me no favors. But I'm trying to train myself to pause and to be thoughtful. Over the years I've trained myself to click into the groove of the morning prayer of gratitude, as close to the moment of waking as I can manage. I'd like for kindness and thoughtfulness to be the same kind of reflexive acts, so innate that I don't even have to instigate them any more. If you're a Star Trek fan, just reading those words has probably caused the theme music to swirl wildly through your head. These are the voyages of the patriarch Abraham. (He'll inherit the extra syllable in this week's portion.) His continuing mission: to explore the ancient Near East, to seek out new tribes and new civilizations, and -- spiritually, at least -- to boldly go where no one had gone before. Abraham is regarded as the first monotheist. Midrash holds that his father Terach was a maker of idols, and that young Abram knew them as false gods and smashed them in his father's workshop. (The same story appears in the Qur'an, as I've mentioned before.) In this week's Torah portion, God tells Abram to boldly go toward a destination which will be revealed as he gets there. Abraham's travels show the importance of the journey. He displays emunah, faith and trust, by allowing himself to wander where God will take him. Jewish tradition holds that he was a paragon of hospitality whose tent was open to all comers. In that, he's not so different from the crew of the USS Enterprise -- though their wanderings aren't explicitly theological. Theirs is a secular humanist vision. Abraham's descendants, too, will wander in what could be seen as a continuation of his voyages. (Judaism: The Next Generation.) Jewish tradition imputes meaning even to the wandering in the wilderness which the Israelites will endure after the Exodus from Egypt, and Moses' life too seems to be more about the journey than the destination. I think we're still on Abraham's journey of discovery. I like to read the opening words of this week's parsha, "lech-lecha," not only as "go forth" but "go forth into yourself." Each of us is Abraham. Each of us is on a voyage of discovery. We're all always going wherever God will lead us. And we're all always exploring new worlds -- even if we're doing so internally, on emotional and spiritual planes, rather than in the vastness of the Gamma quadrant. With gratitude to Joy Fleisig (@datadivajf) and Lee Weissman (@jihadijew) for the Twitter conversation which sparked this idea! There's a Jewish custom of inviting ushpizin, holy guests, into the sukkah each night. In the most traditional paradigm one invites seven (male) Biblical figures; in a more contemporary paradigm one invites Biblical figures of both genders. Each of the invited guests represents or channels a particular mystical energy, so in calling on that figure to invite them to one's sukkah, one is also inviting that figure's qualities to flow into the sukkah and into one's life. For instance, on the first night it's traditional to call on Abraham. In kabbalah, Abraham is connected with the sefirah (divine quality) of chesed, overflowing lovingkindness. On the second night, one would call on Isaac, who is associated with gevurah, boundaried strength. (And so on.) Here's a lovely Seder Ushpizata by Rabbi David Seidenberg -- a liturgy for inviting and calling-upon these incorporeal guests and their holy qualities. And here's a fantastic infographic on the ushpizin, which lists the traditional (male) ushpizin, an alternative list of female ushpizot, and even a set of Hasidic figures who can be mapped to the seven nights of the festival. Shortly before the holiday began I found myself pondering aloud on Twitter how one might map these seven kabbalistic qualities to characters from Firefly. The tweet drew enough response that I figured it was worth expanding into a post! If one wanted to welcome the crew of Serenity on all seven nights of Sukkot, in what order would they be called-on, and what qualities would we ask them to channel for us? I've been remiss in not mentioning this (though perhaps I can be forgiven for that, given the intensity of the High Holiday season), but The Poetry Storehouse is having its first anniversary and is celebrating that with a contest. The Poetry Storehouse is a curated collection of "great contemporary poems for creative remix." All of the poets who have shared their work there are delighted to have our works transformed, both through being read aloud and through visual media (sound collage, videopoems, art, etc.) The first anniversary contest offers options for remixers (create a remix based on any poem currently on the site) and for poets (write a poem in response to one of the three featured videos,) and the winning entries will be published and shared widely. If you are a poet or a remix artist, check it out! And on a related note, I'm delighted to be able to share that Dave Bonta has created a gorgeous remix which features one of my poems ("Ethics of the Mothers") and a poem by January Gill O'Neil along with music by Serge Seletskyy and video from a variety of sources, including some which Dave shot himself. Ethics of the Mothers/Prayer: poems by R' Rachel Barenblat and January Gill O'Neil from Dave Bonta on Vimeo. It's a delight to see my words given new life in this way. In watching the video, I experience my own poem anew; the images Dave chose are ones I would never have imagined, and they work beautifully. This is a stunning videopoem. Go and watch! I'm delighted to be able to announce that a new essay of mine has been published in the Symposium section of Transformative Works and Cultures, the fan studies journal published by the Organization for Transformative Works. The essay is called Fan fiction and midrash: making meaning. Because I am a Jew, the Torah is part of my inheritance, and along with that inheritance comes the obligation to read and to interpret. Reading and interpreting are also things I do professionally as a rabbi, though they're open to, and arguably the responsibility of, every adult Jew. One of the ways that Jews interpret Torah is through midrash, exegetical stories that seek to explore and explain idiosyncrasies in our holy texts. The word midrash comes from the Hebrew lidrosh, to interpret or explain. As Jews constitute community through our interpretive storytelling about Torah, fans constitute community through our interpretive storytelling about pop culture or literary source texts. Thinking of fan fiction as midrash is a useful alternative to Henry Jenkins’ textual poachers analogy. Whereas Jenkins' analogy positions fans as serfs poaching game from the lords' estate in order to make meaning and to reclaim ownership of the storytelling which fans see as our birthright, the midrash analogy positions fans as respected interpreters, analagous both to the classical rabbis who for centuries have interpreted scripture and to the modern midrashists who continue that work today. One of the reasons I wanted to write about this for TWC is that TWC is an open-access journal, which means that everything they publish is available online, for free: no need to pay for access to JSTOR or other academic databases. Go and read: Fan fiction and midrash: making meaning. And while you're at it, check out the rest of the issue. I'm looking forward to reading the whole thing. Last spring, just before Shavuot, I brought two classical midrash about the giving of the Torah at Sinai to my Hebrew school class, and one of my students made some fannish connections. I brought this midrash to my class, and one of my bar mitzvah students -- a big fan of the television show Doctor Who -- raised his hand and said, "It's like the TARDIS was there, translating!" I knew exactly what he meant. With some prompting he explained to the class that the TARDIS is a time machine. It appears to be an iconic blue police box, though it is famously "bigger on the inside." And it contains a translation circuit which ensures that no matter where or when its inhabitants travel, everyone can be understood. I told him I thought that drawing an analogy to the TARDIS was an interesting way to think about the teaching that everyone heard Torah in a language they could understand. The tradition also teaches that "Torah has 70 faces; turn it and turn it, for everything is in it." Arguably the Torah too is "bigger on the inside" -- always containing more than we imagined. Because the Holy One appeared to Israel at the Red Sea as a mighty man waging war, and appeared to them at Sinai as a teacher who teaches the day’s lesson and then again and again goes over with his pupils what they have been taught, and appeared to them in the days of Daniel as an elder teaching Torah, and in the days of Solomon appeared to them as a young man, the Holy One said to Israel: Come to no false conclusions because you see Me in many guises, for I am God who was with you at the Red Sea and I am God who is with you at Sinai: I am Adonai your God. This, too, made my student think of the Doctor, because the Doctor also appears in different guises at different times: young and old, warrior and scholar. He was so enthusiastic about drawing out these lines of inquiry that I promised him that he could speak about this at his bar mitzvah if he were willing to do a bit of extra learning with me, a bargain which he eagerly accepted. As I worked with him over the summer on his d'var Torah ("word of Torah" -- the spoken-word teaching he would offer at his bar mitzvah which would relate Torah and Jewish tradition to his own life), we talked both about how he understood his Torah portion and its relevance to his life, and about how these midrash evoke his favorite pop culture hero. (Of course we also talked about how Jewish understandings of God are different from the Doctor, because that matters too.) When he spoke from the bimah, he spoke about his Torah portion; about his participation in one of our congregation's social action projects; and about how he related Doctor Who to his understanding of what it means to be a Jew. Longtime readers know that I'm a fan of speculative fiction. For those among y'all who share that interest, I'm here to recommend Saladin Ahmed's Throne of the Crescent Moon, the first book in the Crescent Moon Kingdoms series. I loved pretty much everything about this book. And I don't want to spoil it for those who haven't read it yet, because part of the joy of it is seeing how its world unfolds through its twists and turns. But I can say a few things without venturing into spoiler territory, and the first one is: this book has great characters. They are real, whole, complicated people and I come away from the book wanting more -- not because Ahmed didn't give us enough, but because I just want to keep hanging out with them and vicariously experiencing their adventures. This book also does a gorgeous job of depicting a fantasy world which draws on the tastes and textures and smells and sounds and mythologies of a place which is not Western. Reading Crescent Moon catapults me directly into every time I've been blessed with the opportunity to walk the twisty crowded ancient streets of of Cairo, Jerusalem, Amman. This book isn't set in our world, but it evokes some places which are in our world; it feels true to those places even while it goes above and beyond the lived reality of those places. And the same is true of the book's mythology / folklore / magic -- some of it draws on preexisting stories and ideas (djinn, ghuls), and some of it is Ahmed's own creation. I like the different forms of religiosity we see here -- most especially the balance between Adoulla and his young companion Raseed. Adoulla's middle-aged, world-weary, and humor-laced way of being religious doesn't always dovetail neatly with Raseed's youthful fiery desire for spiritual purity, and that difference is neither ignored nor resolved; they exist side-by-side. I like the young lioness Zamia Laith Banu Badawi, and her growing sense of kinship with the alkhemist Litaz, despite their differences. We get just enough of each of their stories to make them real and whole -- and just little enough that I really want more of both of them. (Here's hoping they're both in the next book, eh?) And I like that Zamia and Raseed's relationship remains complicated and interesting to the end of the book -- there were a few different easy ways out, and Ahmed didn't take any of them. And I like how Islam is reflected and refracted in this book. These characters aren't Muslim, precisely, in the same way that Dhamsawaat isn't any earthly city -- but in their ways of interacting with scripture, and their ways of talking about God, they evoke Islam for me as a reader, as I think they are meant to do. Hanging out with these characters makes me think of things I learned while studying Islam (particularly Sufism) in rabbinic school; the quotations from scripture have the same ring, to my ear, as translations of the Qur'an. And I really like the centrality of faith in the way the narrative unfolds. God is all over this book, is what I'm saying, and -- no surprise -- I love that. I find myself thinking of how the Narnia books aren't explicitly Christian, though to a reader who knows Lewis' theology, Christian ideas are visible in the book. (Actually, full disclosure: that was Ethan's insight.) I think this book works with Islam in a parallel kind of way. I've read a number of really good books lately which work with entirely non-Western mythologies, characters, landscapes. None of them are set in our world, exactly. G. Willow Wilson's Alif the Unseen (reviewed here) probably comes closest to our world. N.K. Jemisin's Dreamblood duology and Elizabeth Bear's Eternal Sky books evoke aspects of this world's histories and cultures in really fascinating ways, but they're not set in this world. (Bear does neat things with an alternate-universe Mongolia, and Jemisin's books evoke ancient Egyptian culture and mythology.) All of these books open up vistas beyond the ones we've known, while also managing to give us new ways of thinking about the world we do inhabit. Come to think of it, that's what good speculative fiction always does, for me. Anyway. If this is the sort of thing you like, this book is definitely one to get. And hey! right now only it's six dollars for the Kindle, making it an easy gamble to take. The Local Hero theatrical trailer. If you can't see it, you can go directly to it at YouTube. To my surprise, her face lit up. She told me that she and her husband had been to Pennan, the small town in Scotland where most of Local Hero was filmed. It happens that so have I; Ethan and I went there on our honeymoon. We traded stories of Pennan and what it had meant to us. That's it, she said; you have to show that film. What are the odds of two families in our tiny congregation having been to this remote bit of Scotland for the same reason, and having been so moved? I never imagined, when I was a kid, that I would settle in a small town in New England. I'm a Texan born and bred. Maybe that's part of why this movie grabbed my heart and wouldn't let go. "Mac" MacIntyre is a quintessential Texan -- he works for an oil company, even -- but once he comes to Ferness, he makes connections he would never have imagined. That small northern town changes him. My husband Ethan, who showed me Local Hero when we were first dating, says now that we don't choose favorite movies -- often, favorite movies choose us. So why did this movie choose me? And can I make it relevant to the themes you usually hear me talking about here at synagogue? I could try to argue that Mac is secretly Jewish -- we learn early on that he's not Scottish; his father chose the surname MacIntyre upon immigration from Hungary because it "sounded American" -- but there's no textual evidence for that. Instead, I want to argue that there's Jewish value in this film not because it has any Jewish characters, but because it relates to Jewish themes. For me, part of what makes Local Hero a good movie, and a movie that's worth watching many times, is that it isn't reducible to a simple message or platitude. But when I watch this film through Jewish eyes, I find three primary things which seem to me to be aligned with Torah teachings. G. Willow Wilson's "Alif the Unseen"
I still remember how I felt when I first read Neal Stephenson's Snow Crash in college. Its blending of internet imagination and ancient Sumer, the power of text and the power of code, felt as though it had been written just for me. I felt the same way reading G. Willow Wilson's Alif the Unseen. Alif the Unseen interweaves a story about jinn, and about the power of stories, into a story about a young man who's chosen the nom-de-internet Alif, the first letter of the Arabic alphabet. Alif is a "grey hat" hacker who offers his services to those whose online speech is otherwise in danger, whether they be Islamists, dissidents, or pornographers. I don't want to spoil the book for you -- its twists and turns are so delicious! -- but Alif's programming choices get him into trouble with the dangerous government figure known colloquially as the Hand of God. He and a childhood friend wind up on the run. And his world turns out to be much bigger than he, and likely also the reader, imagined. As I read, I kept marveling at places of intersection between Willow's religious tradition and mine; the notion that angels are like computers, e.g., devoid of free will. Or the sense that the holy language in which scripture was revealed has its own kind of power, and that the words of holy text are uniquely rich because they contain endless unfolding meaning. Of course, I'm a religion geek and a rabbi with a longstanding interest in the places where Islam and Judaism mesh; it stands to reason that I would dig that stuff. But I'm also a longtime lover of comics, a SF geek (there's a moment in the book where a jinn archly references the original Star Wars movie, which made me literally laugh aloud), and a denizen of a handful of different online worlds -- and this book works equally well for me on those levels, too. The titular character is a hacktivist in an unnamed emirate who battles shadowy, oppressive state security forces using methods both digital and arcane. (There are jinn involved, and ancient texts that are supposed to be hoaxes but aren’t. And at least one car chase.) While I was writing, even I thought I was maybe overdoing it just a little, and assigning too much importance to hackers and internet junkies in the Middle East. But I was fresh off a visit to Cairo, where a group of guys I’d met through Twitter organized a signing for me at a bookstore that was packed to the gills. We talked about comics and politics and the media, and I walked away with my heart pounding, thinking “this is really going to work.” I wasn’t even sure what “this” was. Five months later, those same kids were overthrowing the government. I finished Alif the Unseen just as Mubarak left office, Tunisia was under new management, and uprisings had begun in Libya and Syria, in what would come to be called the Arab Spring. Still need more convincing? The first chapter of the book is available online: Excerpt, Alif the Unseen. Enjoy! Four teenage girls, all new immigrants from the Caribbean, arrive at a high school in the heart of what was the epicenter of the Crown Heights riots 20 years ago. As newcomers they know nothing of the long history of tension between the Black and Lubavitch Jewish communities in the neighborhood. They set out to try to educate themselves about a culture so different from their own, in the midst of stereotypes and misinformation about Jewish people. Editor's Note on video: The Crown Heights Community Mediation Center works to improve inter-group relations in Crown Heights by creating a safe space where people of different backgrounds are encouraged to discuss hard conversations, through activities and workshops. For example, the scene in the video where Amy Ellenbogen, the Center's Director, poses a statement about co-existence in the neighborhood is a part of a game, "The Human Barometer", where participants move to different parts of the room to show if they agree, disagree or feel neutral about the issue. It's wonderful to be able to watch and listen as these four girls from the Caribbean begin to learn about their Chabad Lubavitch neighbors -- and vice versa. Of course, the encounter isn't always comfortable or easy; but I give these kids props for their curiosity and their genuine desire for encounter. As I think on it, there are a lot of stereotypes which could stand to be shattered not just in the Jewish communities' relationships with the broader world, but within our own communities, too. For instance, the liberal Jewish kids I teach and the young people who attend yeshiva in a Chabad setting -- those are groups of youngsters who never have a chance to connect and who almost certainly have all kinds of unconscious prejudices and misconceptions about one another. I guess that's always true. I wish it were more possible to create more of these kinds of encounters, both within the Jewish communities and between our communities and others! But meanwhile, kol hakavod -- mad props -- to Selena Brown, Chantell Clarke, Sabrina Smith, and Tangeneka Taylor for going outside their comfort zome and making something really wonderful. New essay in Religion & Literature: "Transformative Work: Midrash & Fanfiction"
Contributors' copies of Religion & Literature volume 43.2! A new midrash is a juicy green leaflet on an ancient tree. Yet contemporary midrash has less to do with faith, or even McClure's "partial faith," than with what Adrienne Rich once called "the will to change." So writes poet Alicia Ostriker in her introduction to the Forum section of volume 43.2 of the journal Religion & Literature. 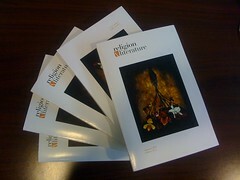 Alicia edited this issue's Forum section, which consists of essays exploring different aspects of contemporary midrash. The essays collected here display extraordinary depth and breadth. Rivkah Walton writes about the feminist midrashic poetry of the 1980s and 90s; Rabbi Jill Hammer explores the work of Israeli poet Yehuda Amichai and American poet Veronica Golos; Eric Selinger explores the theologically and politically challenging poetics of Joy Ladin and Peter Cole; Merle Feld explores her own play "Across the Jordan", which arose out of her experience doing Israeli-Palestinian dialogue in the 1970s; Peter Pitzele explores Bibliodrama as a place of collision between text and improvisation; Norman Finkelstein articulates discomfort with the claiming of the "modern midrash" mantle for contemporary English-language poetry; Monica Osborne writes about how literature of trauma functions midrashically. And the final essay in the Forum section, I am honored and humbled to note, is my own: Transformative Work: Midrash and Fanfiction. A few years ago I made a post called What if we give it away? which explores the idea (riffing off of Lewis Hyde) that blogging, like poetry and like media fandom, is a gift economy. My friend Lorianne of Hoarded Ordinaries suggested in the comments to that post that what I was describing is actually more of a creative barter system than a system of pure gifts. Call it by either name; what I think is neat is that community can be created and strengthened through the open exchange of story and idea, written word and response. I'm blessed to belong to a few different communities which operate on this model. One of them is the community which puts on the annual rare-fandoms story exchange officially named While We Tell of Yuletide Treasure, though most of us call it simply Yuletide. I've seen a few pieces about it (like the recent Yuletide: Stories About (Seriously) Everything), but they don't say quite what I want to say, so I figured I'd write my own. The Yuletide story exchange began in 2003 with about 200 participants. Originally, Yuletide was a fanfiction exchange for rare fandoms -- which is to say, story universes which don't have many stories written in them -- and also for rare characters and pairings within non-rare fandoms. For instance: in the first year of the exchange, one could write Yuletide stories set in rare fandoms, or stories centering around secondary characters in big fandoms like Harry Potter. But that became too hard to manage, so in its second year, Yuletide became a story exchange centering around rare fandoms, period. Peterson talks a fair bit in the essay about representations of religion in pop culture -- for instance, our common notion of what angels look like. "We know that angels have white wings and are surrounded by light, perhaps even a halo," she writes. "We know this because of the constant circulation of the concept in society, from Christmas tree decorations to popular culture." I'm not the only person thinking along these lines. coffeeandink's response to Peterson's essay, Religion !=Christianity, which I recommend reading alongside the Peterson piece, argues that Peterson's article "has a lot of interesting points, but its basic framework is the kind of privileged assimilating universalization that underlies so many discussions of religion in the Christian-dominant West." A few weeks ago I participated in a rabbinic conference call with Judge Goldstone, of the Goldstone Report, and shared a transcript of that call along with some reflections here on this blog (A conference call with Judge Goldstone.) That post got linked pretty widely, and Mohamed Nanabhay, Head of Online at Al-Jazeera English, contacted me to ask whether I would consider writing something for them about the report and its reception in my community. The Israeli government and the American government have done their best to quash the Goldstone report. Many Jewish organizations have joined them. But that's by no means the only extant opinion in the Jewish community. It's important to me that the world know that there are Jews who receive the report in a different way. So I wrote an essay for Al-Jazeera English, which went live there today. It's called The Goldstone Report: A Jewish View. Please be aware that I will not be monitoring comments at the Al-Jazeera website. Though I will moderate comments on this post as usual, I may not be able to respond to them -- this is an unusually busy week for me, and because I have multiple doctors' appointments and a ton of coursework to complete, I will have to hope that the essay stands on its own. Thanks to Mohamed and the other editors at Al-Jazeera English for giving me the chance to speak to their readership. On Wednesday night, October 28, as I was on my way home from the JStreet conference, the Daily Show aired an abbreviated interview featuring Mustafa Barghouti and Anna Baltzer, a Palestinian and a Jew who are working together as part of a broad-based movement toward Israeli/Palestinian peace. The full version of the interview can be seen online, and I'm embedding it here beneath the extended-entry link. It's in two parts; they add up to about 15 minutes of conversation.